Groovy is the fifth level in the Special Zone of Super Mario World. Groovy is very similar in design to the early levels of the first world and is also featured in the demo shown after the title screen; this, combined with the fact that some other Special Zone courses (such as Awesome and Mondo) have designs much like Super Mario Bros. and Super Mario Bros. 3, suggests that the Special Zone courses were among the first to be added to the game. Groovy consists of one horizontal screen, which the player has 300 seconds on the Timer to complete. This level contains five Dragon Coins, and only one exit. Groovy is relatively short compared to other levels in the Special Zone. The player starts out next to a red Koopa Troopa, whose shell can be used to hit the ? Block close by, which contains a Yoshi. 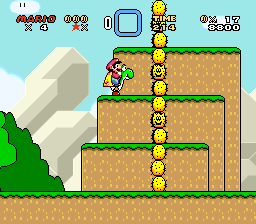 After the first Volcano Lotus, Mario or Luigi can get a Super Star from the Roulette Block, which will help the player defeat numerous Pokeys, Jumping Piranha Plants, and Volcano Lotuses. At the end, there are three Confused Chucks guarding the Giant Gate. This page was last edited on April 6, 2019, at 00:05.